We stopped off at Katherine Cove in the Lake Superior Provincial Park and enjoyed exploring the natural subjects that the beach offers up for photography. From driftwood to a rocky shoreline, and of course our own footprints. Time was marching on and our target today was a campsite at Agawa Bay Campground in Lake Superior Provincial Park. The summer season is nearly at an end in the provincial parks and in a couple of days the campgrounds will be closed for the winter. We decided that we'd stay until the very last day (October 6th) at Agawa Bay campground and set up our site with lake views but still in the cover of the forest - it was just beautiful and very quiet as there were only two other campers in the whole place. 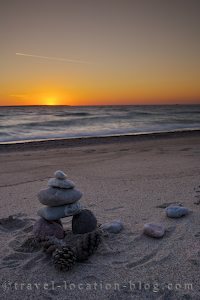 Once settled in to our camp site, we set up on the beach for sunset and enjoyed the peace and quiet of the park and gentle lapping of the water along the shoreline.